Discover the difference between a performance and an experience. Memories of Elvis is an electrifying two-hour concert experience that pays incredible attention to the details that create the most authentic Elvis experience you've seen since the real thing. Ready for an experience of a lifetime? Memories of Elvis is on tour. We've got a full schedule of tour dates so be sure to check back often and find out when the king is coming to a town near you. You won't want to miss Steve Davis & The Memories of Elvis! Do you love Steve Davis & Memories of Elvis? Show your support and stay in touch with fellow fans by joining our Fan Club! Members receive an official membership card, a quarterly newsletter, access to a members-only website, and great merchandise discounts! Not sure what to expect or want to re-live the magic? 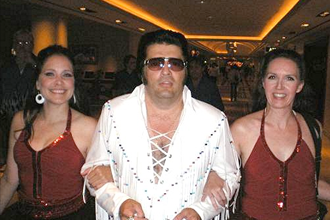 Check out our photos of Steve Davis & the Memories of Elvis in action. 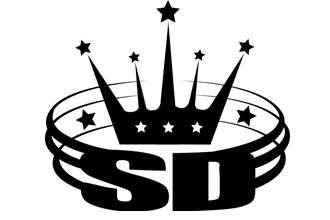 Now accepting fan submissions! Steve Davis gear is here! Don't forget to gear up before each concert and show your Steve Davis spirit. We've got shirts, scarves, stickers, buttons, CD's and more. Check out our stock online and order yours today! “Discover the difference between a performance and an experience. Memories of Elvis is an electrifying two-hour concert experience that pays incredible attention to the details that create the most authentic Elvis experience you've seen since the real thing. “Ready for an experience of a lifetime? 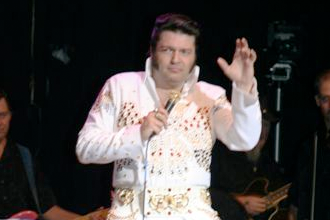 Memories of Elvis is on tour. We've got a full schedule of tour dates so be sure to check back often and find out when the king is coming to a town near you. 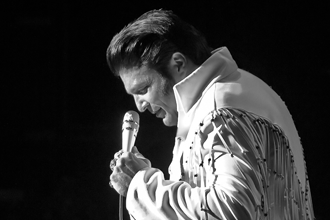 You won't want to miss Steve Davis & The Memories of Elvis! “Do you love Steve Davis & Memories of Elvis? Show your support and stay in touch with fellow fans by joining our Fan Club! Members receive an official membership card, a quarterly newsletter, access to a members-only website, and great merchandise discounts! “Not sure what to expect or want to re-live the magic? 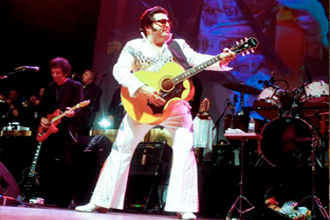 Check out our photos of Steve Davis & the Memories of Elvis in action. Now accepting fan submissions! “Steve Davis gear is here! Don't forget to gear up before each concert and show your Steve Davis spirit. We've got shirts, scarves, stickers, buttons, CD's and more. Check out our stock online and order yours today!